We are extremely happy to announce our new integration 'Google My Business' into ReportGarden. Google My Business (GMB) is one of the most popular local search tools. It’s free and easy to create, manage your clients 'Google My Business' listing, and allows the business to show up in local search and maps results with the NAP(name, address, phone number) information, website link, and Google reviews. 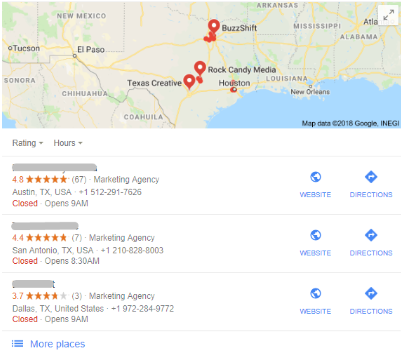 By creating, verifying, and managing your GMB listing, you’ll be able to nab top local search results, manage reviews, and show up near the top of Google’s “three-pack” for local search results near the searcher. For example, Marketing agencies in Texas. In 'Select the type of account' modal, choose Google My Business. Reporting on "Google My Business"
Choose 'Google My Business' in data source. Choose 'Google My Business' Account. The photos and videos which help people find your business across Google and showcase your products and services to people who are looking for what you offer. The language of the location. Set during creation and not updateable. The description of your local post. The type of your call-to-action button whether Learn More, Reserve, Sign Up, Buy, Get Offer. The URL of your call-to-action button. The state where your business is located. A URL for this business. If possible, use a URL that represents this individual business location instead of a generic website/URL that represents all locations, or the brand. The topic of your local post. Location name should reflect your business's real-world name, as used consistently on your storefront, website, and stationery, and as known to customers. The number of times the resource was shown when searching for the location directly. The number of times the resource was shown as a result of a categorical search (for example, restaurant). The number of times the resource was viewed on Google Maps. The number of times the resource was viewed on Google Search. The number of times the website was clicked. The number of times driving directions were requested. The number of times the phone number was clicked. The number of views on media items uploaded by the merchant. The number of views on media items uploaded by customers. The total number of reviews. The total number local posts. The city of your business. The country code of your business. The total number of media items that are currently live that have been uploaded by the merchant. The total number of media items that are currently live that have been uploaded by customers. The number of times the local post was viewed on Google Search. The number of times the call to action button was clicked on Google Search. The reviews given by your customers about your business. The timestamp for when the reply was last modified. The rating given to your business like 3,4 and more. Represents the location owner/manager's reply to a review. Represents the name of the location owner/manager's replied to the review. The review given by the customers who had opted to remain anonymous. After linking the account, it will take few minutes to fetch the data of Reviews and Local Posts. This data will get updated for every 24 hours. You'll get the data of the metrics 'Reviews Count' and 'Local Post Count' from the first review/local post. But, you cannot see the data of remaining metrics for the last 18 months from the current date.